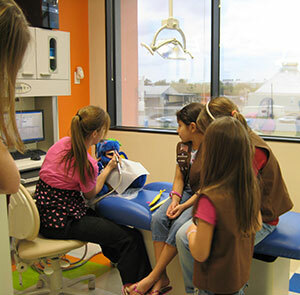 We are more than happy to visit with your children to teach them how to brush their teeth properly, healthy eating habits and familiarize them with what they may expect when they visit the dentist. We can visit your school or day care. We bring items from our office to familiarize the children with them in a "show and tell." We also talk with the children about healthy eating habits to promote healthy teeth and bodies. We offer "field trips" where children are welcome to tour our office. They can have their pictures taken in a dental chair, touch equipment and learn about healthy brushing and eating habits. If you have questions about our school programs or would like to schedule a school visit or field trip, please call us at (281) 238-4746.